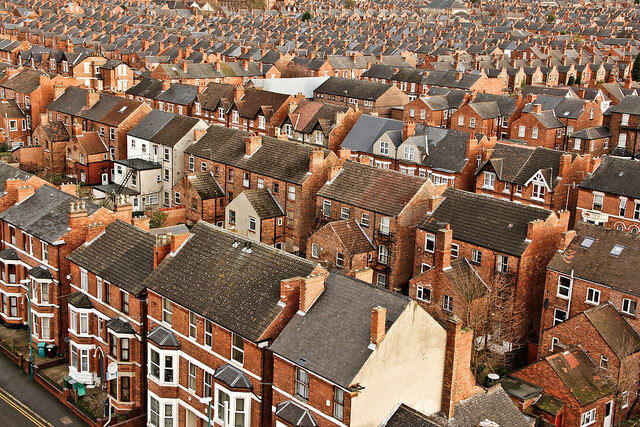 A look at the major trends in UK housing in the past century, including the trends on housing tenure, house prices and the supply of new houses. The Industrial Revolution saw rapid growth in inner cities as people flocked to the city for new factory jobs. This accommodation was often hurriedly built by private enterprise and was often squalid, with large factory populations squeezed into small areas, leading to the classical slums of ‘Dickensian’ Britain. Typically, houses could just be two rooms – one up, one down. Water was from a communal cast-iron pump, with outdoor lavatories. Not all Victorian housing was slums; there was also a growing middle class and affluent new businessman. These houses in Nottingham were built in the Victorian period. These houses in Nottingham were built in the Victorian period. Before the First World War, there was very little, if anything in the way of social housing provided by the government. The only exception was the Workhouse. This was a refuge of last resort, and they were designed to be forbidding, unwelcome places which people would try to avoid as much as possible. The First World War brought about rapid social, economic and political change. An important development was the 1915 Rent Act, which limited the amount private landlords could raise rents on tenants. This resulted from protests by workers who faced long hours and rising rents, with their husbands away at the front. 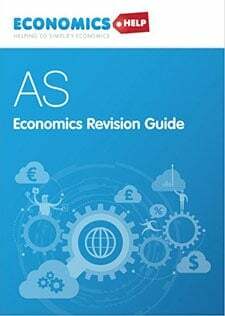 The government was worried by protests and agreed to intervene, breaking a long philosophy of ‘laissez-faire’ economics. The First World War also displayed the poor health of many working class who joined the army. The government was concerned by health and living conditions; after the war, Lloyd George launched a popular campaign to “build homes fit for heroes” The Housing and Town Planning Act of 1919 (The Addison Act) was the first large-scale government intervention to build housing for social use. Local councils were given subsidies to build new houses. The cost of new housing was to be spread between tenants, the Treasury and local councils. The Wheatley Housing Act 1924 also provided provision for the Central government to subsidise the building of council houses. These initiatives led to the creation of new council estates, for example in the Essex towns of Barking, Ilford and Dagenham nearly 30,000 new homes were built by the London County Council. 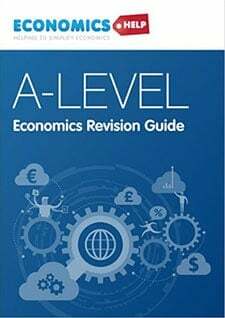 However, the plan to build good quality homes suffered after the 1921 economic recession and the resulting cuts in government spending from the “Geddes Axe” of 1922. 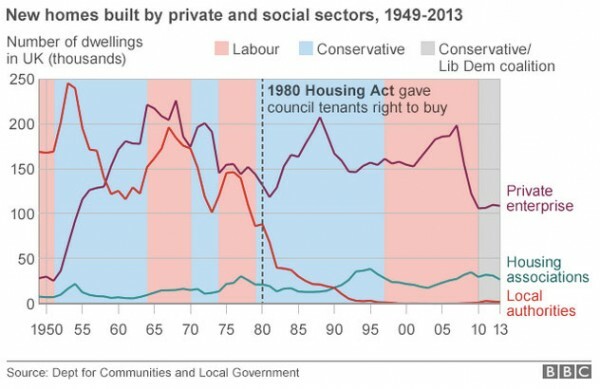 The number of council housing built was less than hoped, but by 1933, 500,000 council houses had been built, creating a new form of housing in the UK. 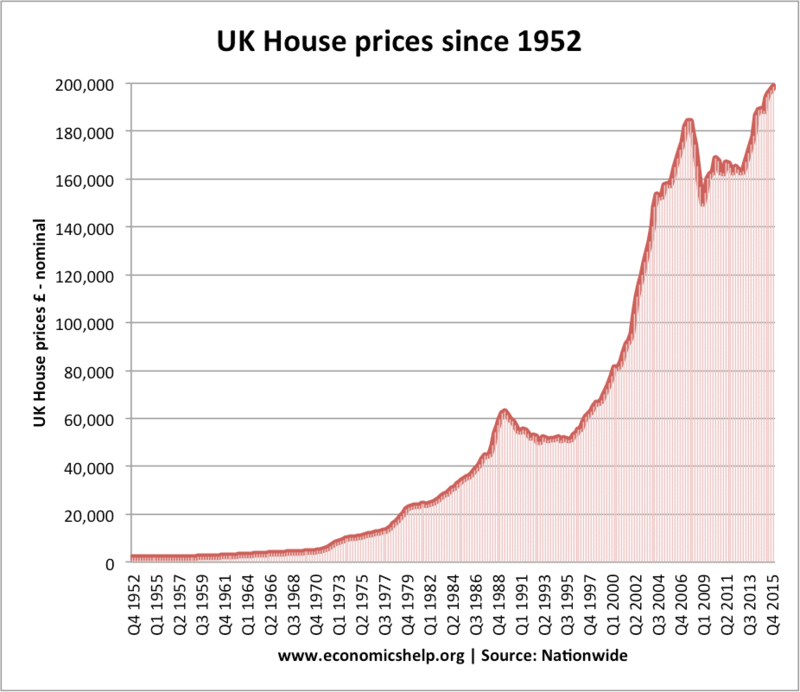 The 1920s, also saw a growth in privately built housing, helped by the Chamberlain Housing Act of 1923, which offered subsidies to private builders. Between 1919 and 1929 just under half a million houses were built by the private sector. 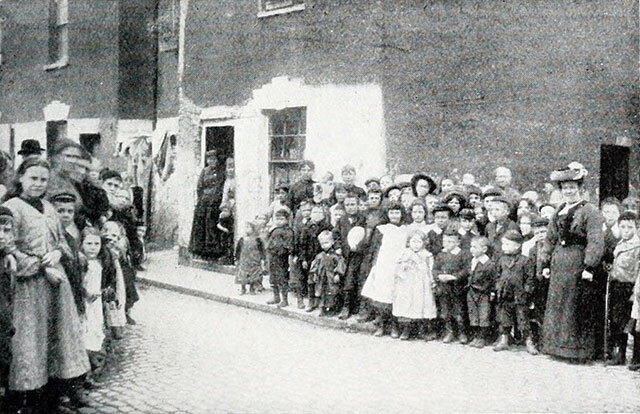 In 1918, there was little in the way of social provision. Over 70% of housing was rented through the private sector – much of this low quality, slum housing. 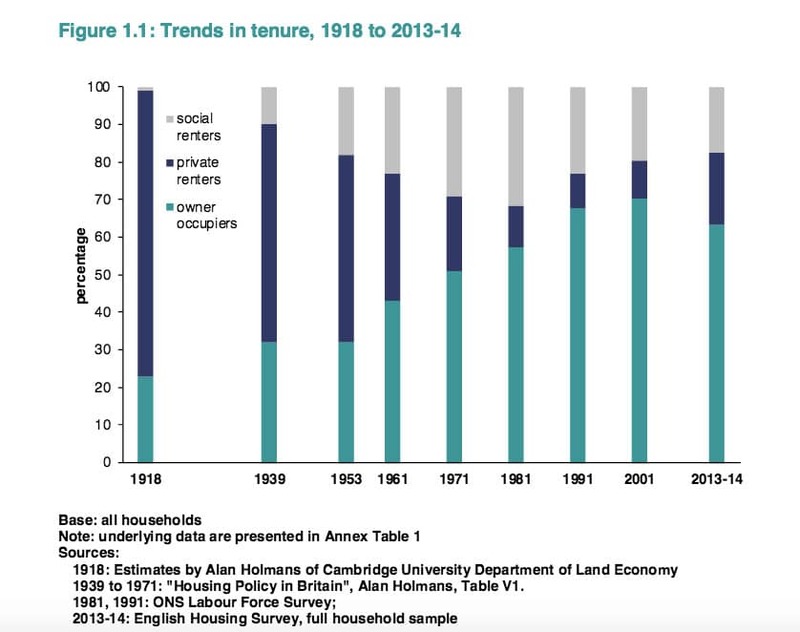 Post First World War, the % of owner-occupied housing continued to rise to a peak in 2001. The 1930s, was a time of depression, especially in the north and outlying regions. However, it was also a period where we see a growth of suburbia and new homes being built alongside the new railways and underground lines. It even led to the term ‘Metro-land’ – the new suburbs in Hertfordshire, Buckinghamshire and other areas just outside London. It was also a period of rising owner occupancy. Growing availability of mortgages with a low average mortgage rate of 4.5% – these low-interest rates were helped by the period of deflation / low inflation. Greater expectations and aspirations of home ownership. However, the government prioritised the building of new homes. Initially, this included ‘prefab’ housing which was very easy to build and designed to be temporary. Over 150,000 prefab houses were built to alleviate the acute housing shortage. In addition to prefab houses, there was a very successful house building policy by local councils. 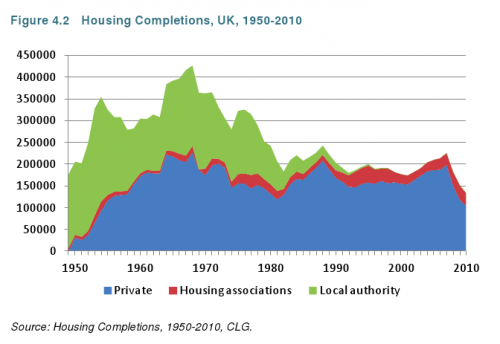 One million new houses were built between 1945-55, helping to alleviate the worst of the housing crisis. Also, there was an on-going slum clearance. 900,000 people were moved out of slums in the 1950s and 1960s. New towns were also built, including Cumbernauld in Scotland and Milton Keynes, England. The building in the front is a grade II listed building. 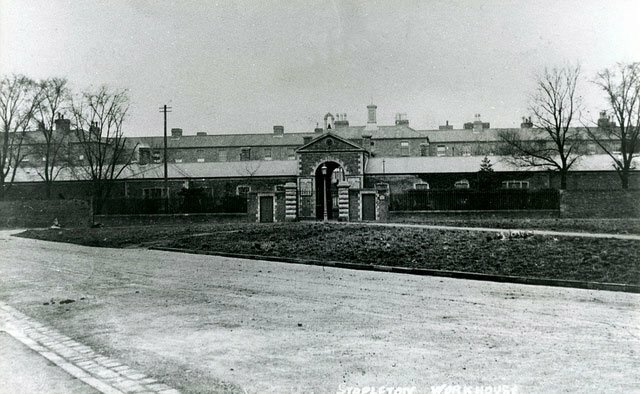 It used to be a workhouse. Relatively low-interest rates and increased availability of mortgages. House prices relatively low compared to wages. The post-war period saw a rise in real wages, but with the rapid increase in the supply of housing, real house prices didn’t accelerate. The increased aspiration to own a home. For the first time, many upwardly mobile working class could aspire and afford to buy a house. 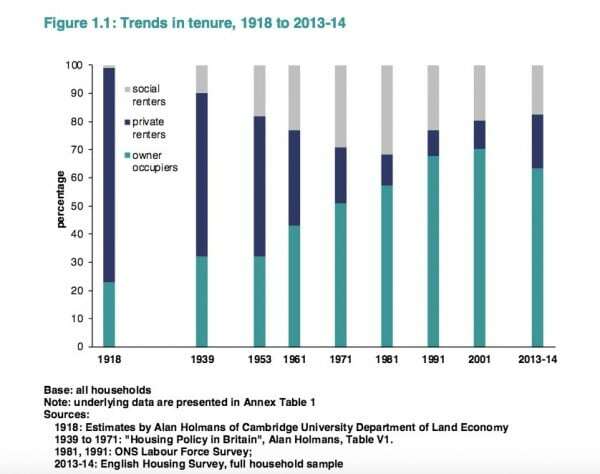 Between 1950 and the early 1980s, the percentage of homes which were bought steadily increased, and the renting sector fell. Home-ownership became a key element of Mrs Thatcher’s housing policy. She encouraged council tenants to be able to buy their council house at a discounted price. This led to a fall in social renters, and large rise in home-ownership. 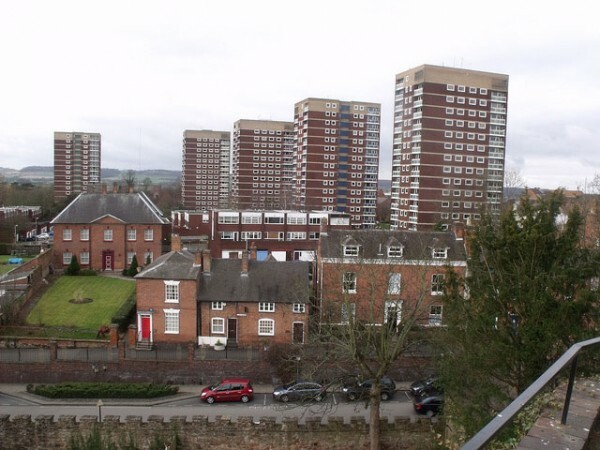 There was an increased stigma with council housing, especially inner-city tower blocks which were built in the 1960s, but by the 1970s and 1980s had become associated with high crime, vandalism and drug use. The sale of council homes was very popular in the 1980s. 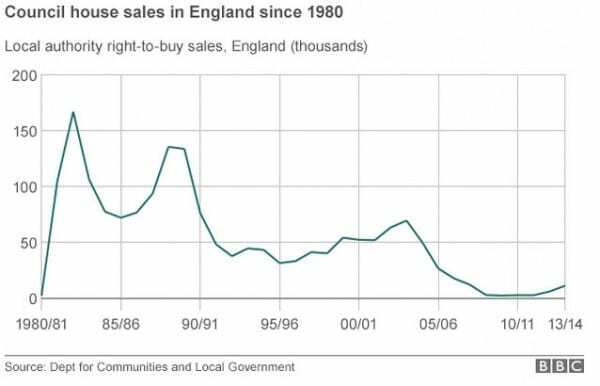 As well as selling council homes, there was a sharp fall in the number of homes built by local authorities. To some extent, this drop in social housing was taken up by private enterprise. But, after the housing crash of 1990, the number of homes built by private enterprise fell to 150,000 a year – much lower than the growing number of households. The 1980s and 1990s also saw deregulation of the finance sector, with growth in a new type of mortgages, which allowed bigger lending multiples. House prices rose rapidly in the 1970s, but they remained affordable. 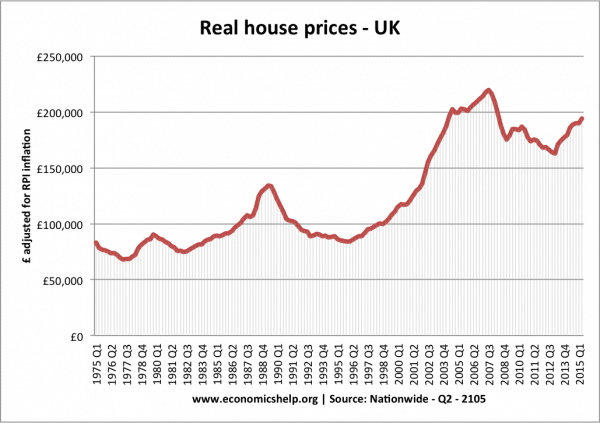 The late 1980s saw a boom in house prices, helped by rapid economic growth and high confidence. 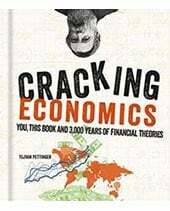 However, the recession of 1991 and a rapid rise in interest rates, caused a major correction. 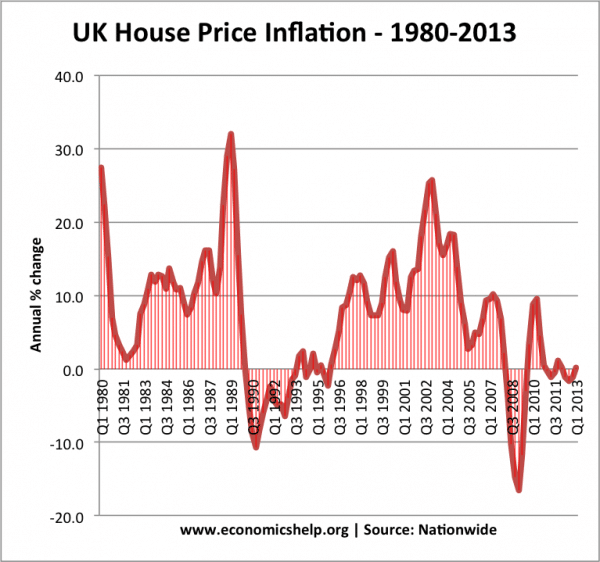 However, since 1993, house prices have continued to rise faster than inflation and real wages. 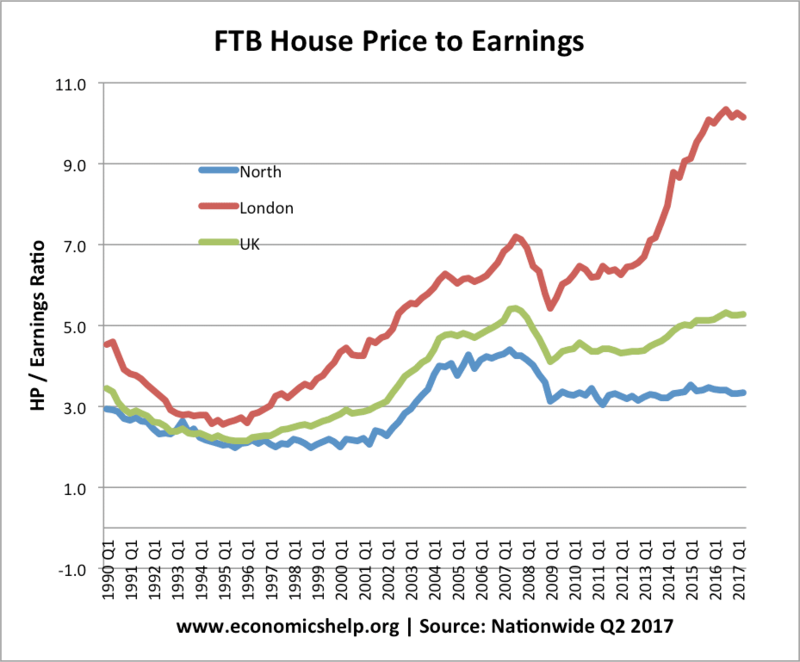 It is has led to record ratios of house price to earnings – especially in property hotspots in the South and London, especially. Despite the rise in the number of households, house building has not kept pace with rising demand, pushing prices higher. After the credit crunch of 2008, it also became harder to get a mortgage. 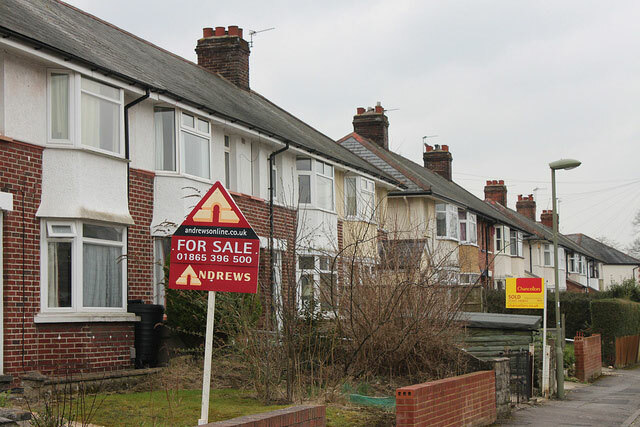 There has been a growth in demand for housing from buy to let investors and overseas investors. With house prices becoming unaffordable for many first time buyers, we have seen a fall in the percentage of home-owners and a rise in private renting. A rise in the price of renting. There is an old saying that bricks and mortar are a safe investment, but house prices in the UK have been increasingly volatile. 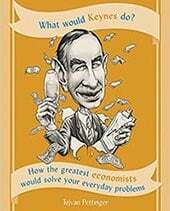 Confidence / market expectations / bandwagon effect. 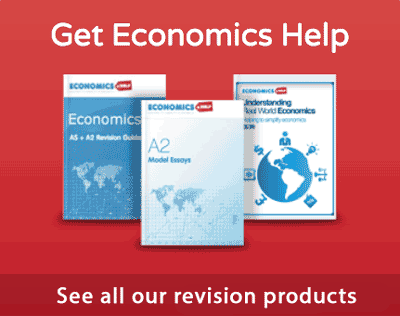 What’s the mechanics of the adjustment for real house prices? 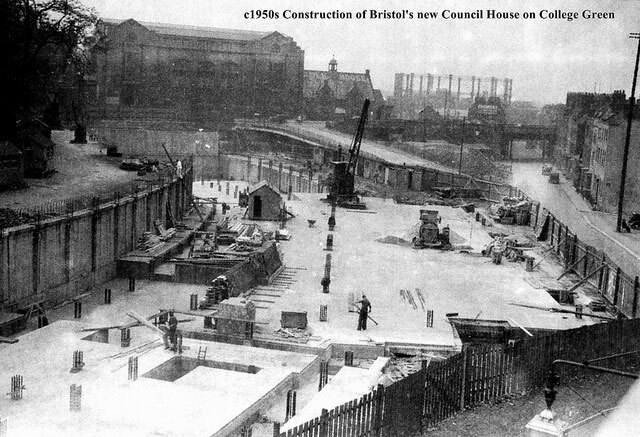 Amusingly, the picture of “council house building” in the Post-war Period section, is a picture of the then new Bristol council offices being built, not for tenants! !